Peterborough Panthers were beaten 52-38 in an Inter-League Challenge match at Birmingham last night (September 12). 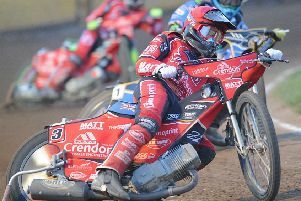 Only two regular members of the Panthers septet were on duty in the West Midlands although Ben Barker, who is expected to play a significant part in the closing weeks of the season as a guest, was in terrific form on his old home circuit. Barker dropped just one point from five rides, missing out to Adam Ellis in Heat 4, but he then spoiled the Birmingham rider’s maximum by partnering Paul Starke to a 5-1 in Heat 15. In between, Barker also provided the race of the night when he came from last to first in Heat 9, making a stunning move to overtake Jason Garrity. Elsewhere for Panthers, Paul Starke notched double figures and guest Mason Campton won his last two rides after mechanical trouble early in the meeting. Panthers trailed by 20 points at the midway stage after conceding a hat-trick of 5-1s, but maximums of their own in Heats 12 and 15 helped make the final score a respectable one.